The issue of how to improve local leadership and reinvigorate local democracy has been on the political agenda for some time. Both Conservative and Labour politicians have promoted the idea of directly elected mayors as part of the solution to the perceived problems of the more traditional committee system of local government. The mayoral model is premised on the assumption that local councils need a figurehead, to provide clear, accountable local leadership. The debate about mayors can be firmly located within the debate about the modernisation of local government and the role of local politicians in reconnecting local government to local communities. The rationale for elected mayors is about clarity of decision making, visibility and profile. In May 2002 the first elections for mayors were held in seven urban areas including Doncaster, Hartlepool and Middlesbrough. Subsequent efforts have been made over the last 10 years by different governments to introduce more directly elected mayors in cities and urban areas. In reality, however, the introduction of directly elected mayors seems to have had little impact on political attitudes or voter turnout and overall the general public seem less than interested in the whole notion of elected mayors. The mayoral referendums themselves and the actual mayoral elections have averaged a voter turnout figure of just 29%, not exactly a ringing endorsement for their success in revitalising local democracy. 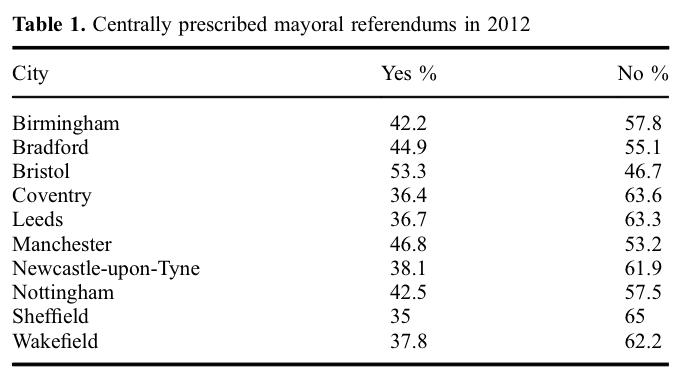 In terms of the 50 mayoral referendums that have been held, between 2001 and 2012, only 15 resulted in a ‘yes’ vote. A further round of referendums were held in the 10 core cities in England in 2012, with only one city (Bristol) voting to have an elected mayor, and then only by a small margin and with a turnout of only 24%. However, there are signs that where sitting mayors come to the end of their first term of office, voter turnout in subsequent elections increases significantly. Which given one of the primary objectives of the mayoral model, as promoted by government, is to increase voter participation, there could be seen to be a positive impact if this trend continues. In the early elections for mayors in 2002/03, the majority of those elected were independent candidates, with only 4 out of 12 representing the same party as that in control of the council. However, the trend is changing, with 8 of the 15 directly elected mayors (excluding London) representing the Labour Party and only 4 independents. Evidence from existing mayoral elections also suggests that the incumbent mayors are re-elected with a higher vote than originally achieved. An illustration perhaps of the existing visibility and profile of mayors giving them an edge over competitors? So what’s next? There will be mayoral elections in London, Bristol, Liverpool and Salford next year (2016), which should provide an interesting insight into whether or not the mayoral model is beginning to take hold and make a difference in England. It will also help to inform us about whether or not people are more engaged with politics and democracy in these areas. Will voter turnout be higher in areas where there are mayoral elections as well as local council elections? It remains to be seen, but the general trend is going in that direction. In Bristol it will be interesting to see if the current independent mayor, George Ferguson, holds onto the role, or if Labour can stage a comeback after losing out last time. There may also be a continuation of the increased support seen in this years local elections for the Green Party. So we could see a 3-way fight to become the next mayor of Bristol. At the very least, with all 70 councillors as well as the mayor up for election, we should see a high profile election campaign. But will we see an increase in public engagement and more people voting? Let’s hope so! This entry was posted in Bristol, Politics and tagged bristol, cities, directly elected mayors, george ferguson, local councils, local democracy, voter turnout by Tessa Coombes. Bookmark the permalink.